A genetically engineered utopia is threatened, first by a stellar core fragment that could destroy its home and then by knowledge of what life is like on the outside. On top of all the times it happens in TOS, how often does the Enterprise come across humans where there aren't supposed to be any? In TNG thus far, it has happened at least 5 times, not counting this episode: "The Neutral Zone," "The Royale," "Up the Long Ladder," "The Ensigns of Command," and "Suddenly Human." There can be even more, depending on how loosely you interpret the question. No one episode can be criticized for recycling this plot device, but the show as a whole relies on it far too often, turning into a crutch. It's not as bad as the TOS red shirt phenomenon, but it borders on being nearly as cliché. The set-up for this story is an amalgam of some of those episodes I just mentioned. It has the genetic engineering angle of "Up the Long Ladder" (and "Unnatural Selection"), along with the relocate-or-die conundrum of "The Ensigns of Command." The lower-resolution graphics and old-fashioned fonts for the colony's consoles is a nice touch. Geordi getting a chance to wax about his blindness is nice, but it's subject matter that TNG already covered pretty thoroughly in "Loud as a Whisper." His monologue dances on the edge of having something to say about abortion, but the writers shy away from it instead of getting bold about contentious social issues the way TOS would have. Forgive the politics, but maybe the reason this episode never goes there is because Geordi was headed in a pro-life direction instead of the typically left-leaning social direction Trek is known for. The Troi and Conor falling in love subplot is not successful. Part of this is the fact that Troi has already fallen in love too often on this show; part of it is how rushed these miniature love stories are in episodic television; and part of it is how little chemistry the two actors have with each other. If there had to be a love story angle, the writers would have been wiser to focus on Geordi and Hannah Bates (though that would have still presented difficulty since Geordi's love life has been the focus of more than one previous episode as well). Hannah knows her way around Engineering extremely well for somebody who wasn't even familiar with transporter technology a couple of days ago. I grant that she might be super-smart and able to learn quickly, but she's no replacement for the ship's actual engineers who are trained for and experienced with the Enterprise engines. 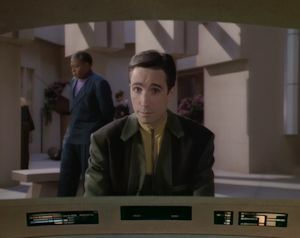 The actor who plays Conor, John Snyder, really flubs the climactic confrontation with Picard. I like him, but he's not a good match for the role. His acting is much better in "The Enemy," in which he plays the Romulan Bochra. I disagree with Picard's final assessment. I don't think the Enterprise doomed the colony, because the colony was already doomed by its own flawed ideology. If the idea of a genetically created utopia was as perfect as the founders of the colony thought it would be, then the core fragment wouldn't have posed a threat and nobody would have wanted to leave after encountering outsiders. If blame must be assessed, that blame does not belong on the heads of Picard or his crew. I appreciate how this episode is driven by character, how the core conflicts are all based on logical and relatable motivations. However, in framing the story thus and emphasizing how "perfect" these people are supposed to be, the characters all come across as one-dimensional and boring (there's the charismatic leader, the combative advisor, and the sterile scientist). In addition to that, as sci-fi, it is plagued by a lack of focus. Trek likes to deal with genetic engineering and the potential consequences of it, and this story tries to attack it from an original context. There are flashes of brilliance--Geordi's VISOR providing the key to one problem, for example, showing how imperfection is preferable to perfection--but the overly-talkative story squanders the potential for a philosophical meditation on predestination and a provocative take on abortion. It's not a terrible episode, but "The Masterpiece Society" is nonetheless mediocre, a real missed opportunity.